My parents took the boys and me to the Chicago Botanic Garden this week, as a kind of end-of-summer outing. It’s a 385-acre living plant museum situated on nine islands featuring 24 display gardens in Glencoe, Illinois. We strolled the grounds and took in two exhibits: the Model Railroad Garden and Butterflies & Blooms. The Model Railroad Garden is an outdoor display with 16 garden scale trains on 1,600 feet of track. The buildings are handcrafted with natural materials, including twigs, bark, leaves, acorns, and pebbles. It reminded me of an episode of a short lived horror anthology, DARK ROOM, called “Siege of 31 August,” starring Ronny Cox as a farmer tormented by his memories of war when his son’s toy soldiers come to life. The railroad garden looked perfectly innocent in the daylight, but I bet it’s scary as hell at night, and I’m just glad we were there on August 29, instead of August 31. Butterflies & Blooms is a netted greenhouse filled with butterflies, which seem pretty innocent themselves one on one, but when there are hundreds of them flitting around, landing wherever they please, including your hair, I couldn’t help but wonder what a dose of radiation might do to these harmless little beauties. Their coiled proboscis might become some horrifying stinger, or they might grow tusks or some damned thing. So overall, a nice day, but I wonder why I can’t even go to a garden without imagining something horrible happening. At least I didn’t see a topiary making its way toward me with a haunted hotel looming in the background. 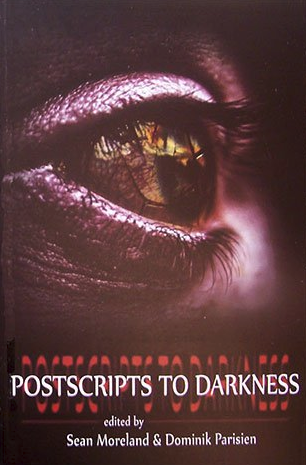 The original POSTSCRIPTS TO DARKNESS anthology, edited by Sean Moreland and Dominik Parisien. My short story, “Thirteen Seconds,” has been accepted for publication in POSTSCRIPTS TO DARKNESS III, to be edited by Sean Moreland and Aayla Ahmad, and published in the summer of 2013 as a paperback. Moreland earned his PhD in English and American literature at the University of Ottawa, where he now teaches part-time. His areas of expertise include modern and contemporary American fiction, Gothic and horror fiction and film, gender and psychological theory, and (post) modern poetics. Moreland and Ahmad co-edited the scholarly collection FEAR AND LEARNING: ESSAYS ON THE PEDAGOGY OF HORROR (McFarland, 2012). Ahmed’s doctoral dissertation was a comparative study of horror fiction, and her research interests include the cultural politics and poetics of horror fiction and film, feminist activism, and diasporic cultural production. She wrote “Gray is the New Black Face: Race, Class and Zombies” for GENERATION ZOMBIE: ESSAYS ON THE LIVING DEAD IN CONTEMPORARY CULTURE (McFarland, 2011). “Thirteen Seconds” is a dystopian super-science story about a scientist who is convicted by the court of a totalitarian government and sentenced to death–giving him the chance to conduct one last experiment in front of a world wide audience. Presenting the “official” high-definition book trailer for CHIRAL MAD, coming this fall from Written Backwards. The updated trailer features new music from editor Michael Bailey and an updated line-up, including Gord Rollo, Gary McMahon, Monica O’Rourke, Barry Jay Kaplan, Eric J. Guignard, Gary A. Braunbeck, Gene O’Neill, and many others. Each story in the anthology, including my own, “Mirror Moments,” features some element of chirality. Something is chiral if it is not identical to its mirror image–if it can’t be superimposed on it, like, say, your hands, for instance. CHIRAL MAD will be about more than hands, though. Think about chirality in the abstract, and you open up all kinds of possibilities, which is what makes it such a great theme for a psychological horror anthology. Written Backwards will officially release CHIRAL MAD at Anthology 2012 in Portsmouth, New Hampshire the weekend of November 9th-11th. All profit from sales of this anthology will go directly to Down’s syndrome charities. “Doppel-Änger” to appear with the work of Marcel Admiraal (pictured), Linda Adams, and Damien Keith. My story, “Doppel-Änger,” has been accepted by Indigo Mosiac Publishing for its upcoming anthology, THE DARKNESS WITHIN, which will be available as a perfect-bound paperback later this year. In THE DARKNESS WITHIN, you’ll find stories set in many times and places, with darkness found almost anywhere and any way you can imagine. It could be the darkness inside a mind, or inside a ping-pong ball; within a universe or within an atom. My story will be anthologized along with the works of many talented writers, including Marcel Admiraal, author of the short story collection BENEATH DARK WATERS, Linda Adams, author of “Sand Dollar Wishes,” and Damien Keith, author of the novel SHADOW OF THE CITY. Publication details, including a more complete list of contributing authors, will be published in this space in the coming weeks. The kids and I decided to squeeze a little summer out of our last full Saturday together before school starts by visiting the Native American burial grounds about two miles from the house where I grew up. Wolf and Heath on the east shore of the Des Plaines River. The Robinson family burial grounds, which are said to be haunted, are part of the Cook County Forest Preserve, accessible just off the southwest corner of Lawrence Avenue and East River Road in Norridge, Illinois. Alexander Robinson, who was also known as Chee-chee-pin-quay (or ‘Blinking Eyes’), a chief of the Pottawotami, Chippewa, and Ottawa nations, was granted a large tract of land along the Des Plaines River on July 29, 1829 by the treaty of Prairie du Chein for helping the families of John Kinzie and Nathan Heald during the Fort Dearborn Massacre. The final resting place of the Robinson family, located southwest of Lawrence Avenue and East River Road in Norridge, Illinois. Robinson’s descendants lived peacefully on the land until their farm building burnt to the ground on May 26, 1955. No one was hurt. Firefighters rescued Robinson’s 89-year-old granddaughter, Katherine Boettcher, her son, Herbert, and his friend, Tony Bistry. But less than five months later, three boys weren’t so lucky. On October 16th, the bodies of three murdered boys–John and Anton Schuessler and Robert Peterson, all aged between eleven and fourteen–were found in a ditch in Robinson Woods. The murder was unsolved for 39 years, when Kenneth Hansen was finally arrested, charged, tried and convicted of killing the three boys. But it was shortly after their deaths that people started reporting strange phenomena in the area, notably the sound of Native American toms, and the smell of lilac suspended over the burial spot, even in the dead of winter. Heath, 6, doesn’t smell anything funny except Dad (photo courtesy of Wolf Larsen, 8). Neither the boys nor I heard or smelled anything bizarre, but we did get to see a deer up close and personal. Heath (left), deer (center), Wolf (right). We also saw a hermit crab and a tadpole near this zombie retention grate, but booked out of there pretty quick when we thought we heard groans echoing from the shadows. I know there’s zombies in there. It smelled like zombies. And yes, those are cobwebs. NOW I LAY ME DOWN TO REAP, which includes my short story, “Fugue State,” is now available for European shoppers at Amazon.co.uk. I’m stateside, so my paperback copy has already arrived, as in just arrived today. 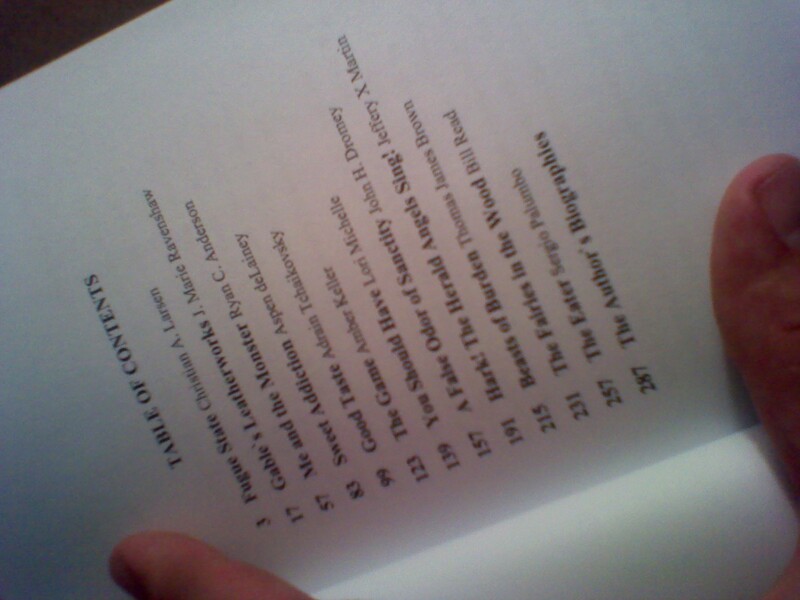 And there I am, right at the top of the table of contents. “Fugue State” features in NOW I LAY ME DOWN TO REAP. I also received by paperback copy of FORTUNE: LOST AND FOUND, featuring my short story, “The Plagiarist’s Wireless.” And its Friday afternoon. So I win! Written Backwards, publisher of the upcoming psychological horror anthology, CHIRAL MAD, has released an updated cover to include all the featured authors, and there I am on the bottom of the front cover, right next to Jeff Strand. CHIRAL MAD will be released at Anthology 2012, November 9th-11th in Portsmouth, NH, and some of the authors will be on hand to sign. If you’re planning on attending, be sure to get there early. The first 50 to check in will receive a donated, complimentary copy. You are currently browsing the exlibrislarsen blog archives for August, 2012.